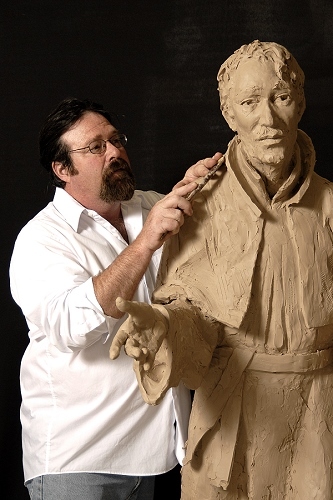 Sculptor, Jack Kreutzer makes his home in Loveland, Colorado. His work has earned him numerous awards and commissions. Jack Kreutzer discovered art at an early age and he still manages to approach it with boyish eagerness. Kreutzer's work ranges from the human figure to wildlife - from realistic to a hint of the abstract. His finished textures range from the loose to refined. His inspirations range from the rhythm of the human body to those of the clouds. Kreutzer's art and life have a hint of whimsy about them. His father worked for the Bureau of Indian Affairs, which took the family to the Pineridge Reservation in South Dakota where Jack was born. Together with his sister he attended drawing classes at Northern State College in South Dakota and was awarded a short term scholarship to the University of Kansas. Kreutzer attended Murray State College in Kentucky before moving to Mexico to study with the German artist Lothar Ceistingbaum. He returned to Colorado where he studied at Colorado State University, earning a Bachelor of Fine Arts degree in 1977. He maintains his studio near his foundry and next door to the Loveland Academy of Fine Arts where he teaches sculpture to a new generation of artists.